We currently have one job opening. 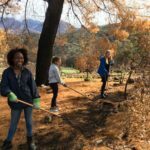 Stewardship of The Ojai Foundation’s (TOF) 36-acre center in the Upper Ojai Valley is integral to the work that we do. We not only care for a place but also work to embody practices and grow stewards and stewardship consciousness. We work closely with the practice of council, striving to think and work as a circle. Land stewards identify, prioritize, and complete the work needed with the land and facilities in order to support the programs, priorities, vision and goals of TOF. Ability to be self-directed and work well as part of a team in a community environment. Experience and/or openness to learn the practices of TOF (including council, mindful work, etc.). Ability to communicate clearly, follow through with commitments, give and receive feedback gracefully, and be open to personal and/or spiritual development through the work at TOF. Experience in facilities management on a semi-wild land base (gardening, fire clearing, irrigation, mowing, pruning, planting, etc.). Ability to work outdoors in a semi-arid environment, including walking up and downhill, and to lift up to 60 pounds. Ability to learn quickly and thoroughly and recognize and remedy mistakes as they arise. Ability to recognize and clearly communicate one’s own limits in skill, experience, or capacity for a given task. A background and experience in Permaculture practices and principles. Familiarity with solar electric and gray water system management. A wide range of contracting, building and hands-on repair and maintenance skills (basic electrical, plumbing, propane, etc.). Proficiency with a chainsaw and other power tools, as well as hand tools. Manage and oversee any work team(s), including laying out work, checking for quality and completion, hosting team meetings, signing worksheets, and problem-solving issues as they arise. Care for and help manage the land-based facilities and systems, including working independently. Maintain and improve the highest possible standards of regenerative land stewardship. Provide education about new and existing systems and best practices to community members and staff when appropriate. Personally provide physical skilled labor for regular maintenance and ongoing projects on the land in addition to working with and managing volunteers on land tasks when needed. Support the acquisition, organization, maintenance, and disposal of tools and equipment. Engage in other land, gardens, and facilities repair, upgrades, and maintenance as needed and as they arise, including a focus on fire recovery. Work within the budgets for land maintenance costs and special projects. Be available for emergencies related to facilities and infrastructure. (i.e. water main break) and have the ability to resolve them. Report and communicate with local and state agencies and independent contractors as necessary. (i.e. Reporting for water and well use, fire prevention and utilities). This is a full time, hourly position. Compensation is $17-19/hr, commensurate with experience. All new hires are subject to a 90-day review period. Employee becomes eligible for medical and dental benefits upon successful completion of the review. Employee will also have the option to contribute to a 403(b) retirement plan.